Symbolizing the influence and economy of this large city, the skyline of Toronto in Ontario, Canada is beautiful during the hours at dusk. 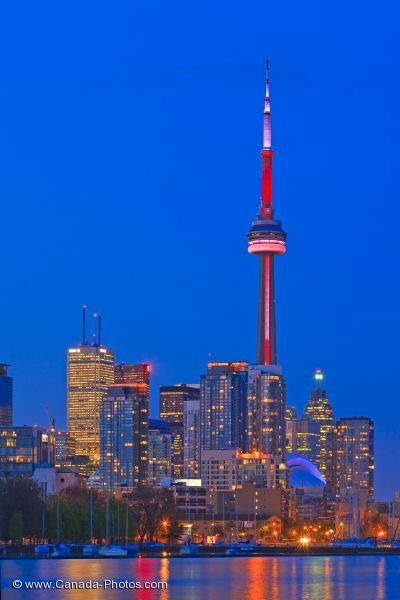 The sky turns a unique shade of blue as the waterfront buildings become illuminated, making the CN Tower the most prominent building across the skyline. Lit up in red, the CN Tower is the second tallest building in the world and Canada's tallest National Tower, making it the most popular tourist attraction in Toronto City. The stillness of Lake Ontario creates the ideal setting for the reflections of the lights to twinkle in their various hues across the surface of the water. Picture of the waterfront skyline of Toronto City in Ontario, Canada and its beautiful reflections.